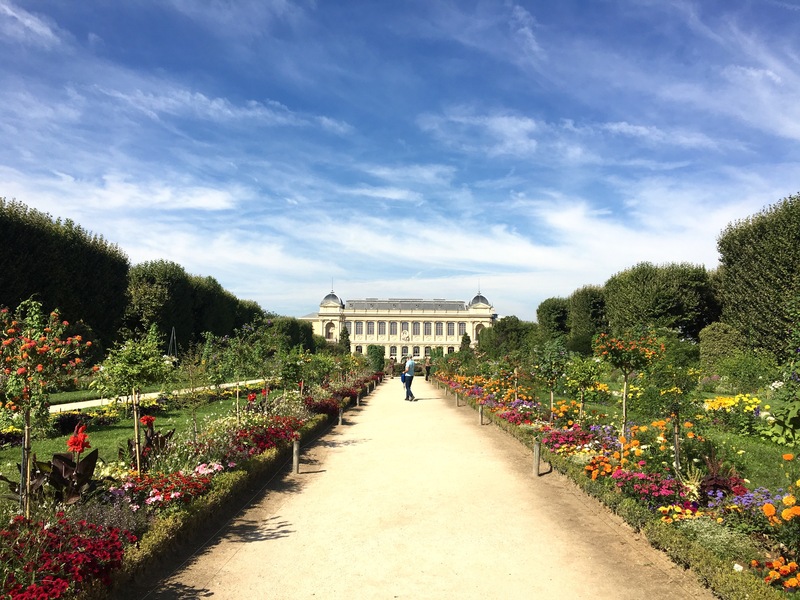 I arrived in Paris in my hiking clothes: long green pants that zip off at the knee, a t-shirt over a tank top, my good socks, my sturdy and quite worn in shoes. I wore my pack, too, and over my right shoulder was a small duffel bag, all the extra clothes and items I’d needed for the writer’s retreat I’d just left. I felt just a little strange, and nervous. My walking stick, which I’d carried for the last 34 days, had been left behind at La Muse; tucked away in the corner of a basement room where, hopefully, I might be able to find it again. 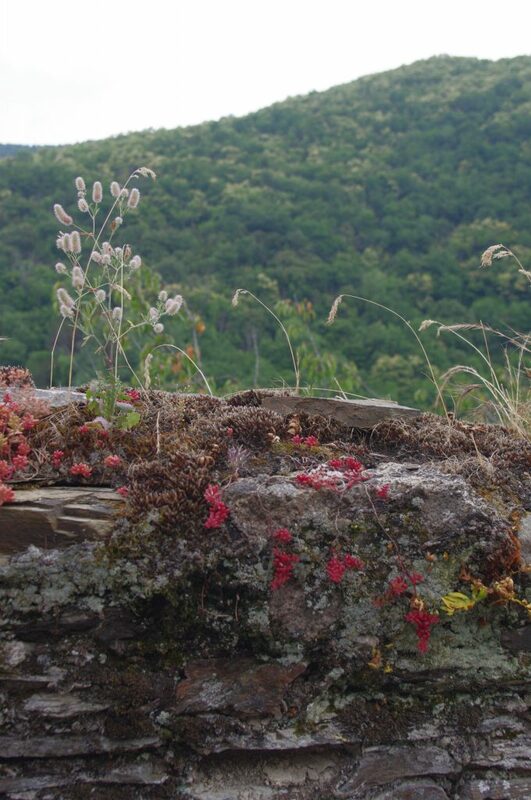 My loaded pack felt heavy, though it was a weight that I had gotten used to just weeks before, as I hiked through the Chemin du Puy. Already, I was out of practice. But I wasn’t in Paris to be a hiker or a walker, was I? I thought that maybe I was here to continue my writer’s retreat but I wasn’t sure about that, either. 1. I missed those full days of walking, and part of me wished that instead of a week in Paris, I had organized a week long trek somewhere new and exciting. 2. I missed La Muse. I missed Homer and the way he would bound up to me and then bound away, dancing in a circle when he knew we were going for a hike. I missed, already, my room with the big window and the view of the mountains, I missed the friends that I’d made, the little writer’s community we’d formed. 3. I love Paris. I really, really love Paris. But why was I spending a week in the city, alone? What was I going to accomplish here? 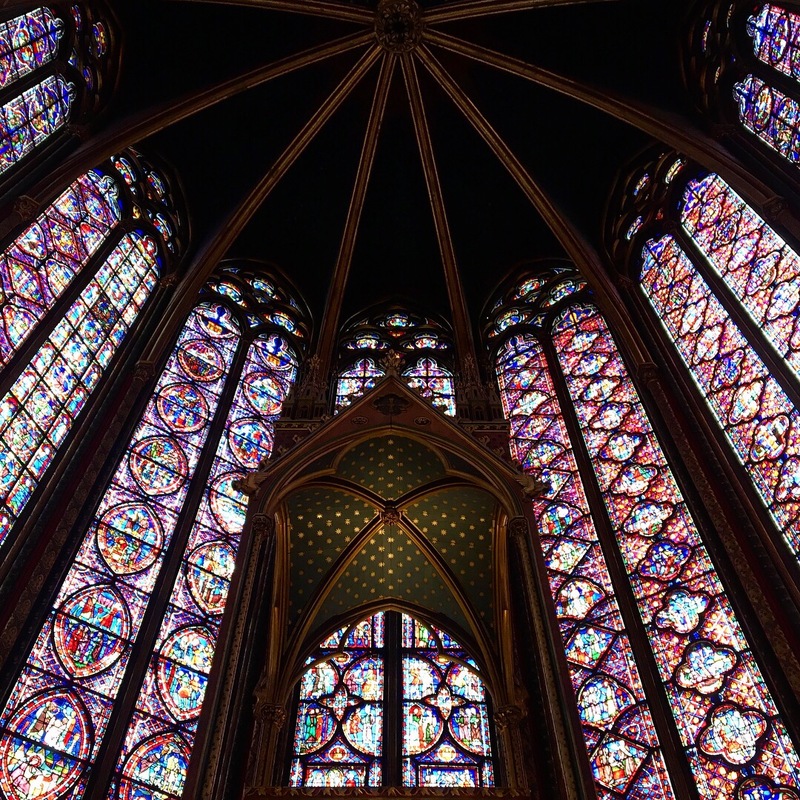 I already know Paris, at least I know the things that tourists know: where to get a hot crêpe and what the view from the top of Notre Dame looks like, how to find the room with the Van Gogh’s in the Musée d’Orsay and how to open the door of a car on the metro. 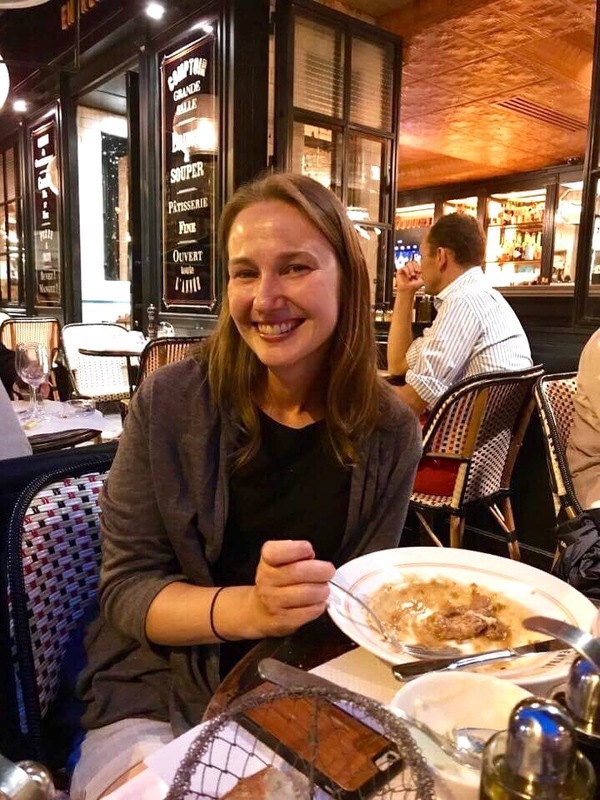 I’d spent time in Paris at least a half dozen times during the year I studied abroad in Toulouse, and in the last 4 years, have spent between 1-4 days in Paris every summer. It’s become a regular thing, a mandatory swing through Paris when I’m in Europe. 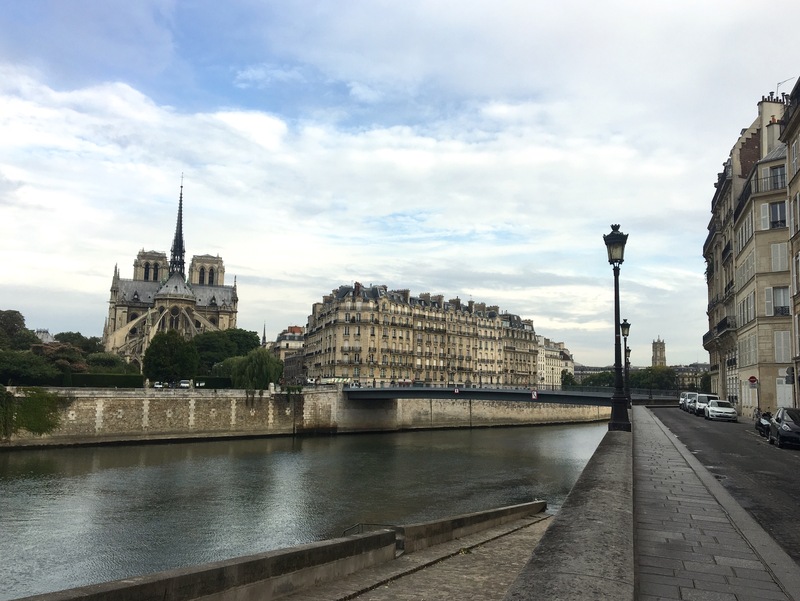 Sometimes all I have to do is buy a baguette and walk down the streets of the Île de St Louis and come upon Notre Dame and stare up in wonder. Now I was in Paris and I had an entire week and I wondered: am I going to continue to be in love with this city? Am I going to become restless? Will I wish I were somewhere else? Here are the answers: Yes. No. No. My days in Paris didn’t exactly have a routine, though I suppose in some ways, little ways, they did. I’d wake up between 7 and 8am, though sometimes if I was awake in the 6 o’clock hour I’d roll out of bed and walk onto my balcony to see if there was a good sunrise. Several times, there was. Once I was up for good I’d spoon some coffee into the little stove top expresso maker and then take a shower, toweling off just as the coffee was ready. There was a small fridge in the “kitchen” of my place and on my first day I’d stocked it with some essentials: yogurt, fruit, cheese, meat. I’d have a small bowl of yogurt with my coffee and flip through a guidebook and come up with ideas for the day. Around 9, sometimes earlier, I would set out. The city is quiet in the morning, even at 9 many places are just beginning to think about opening, the tables start to go out in front of the cafes, brooms sweep leaves and trash off the pavement and sometimes I’d pass men or women hosing off the sidewalk in front of their shops. Trash trucks drove up and down the streets, bottles would crash and shatter as recycling bins were emptied. Usually, the first thing I’d do was stop for another coffee, or a croissant. 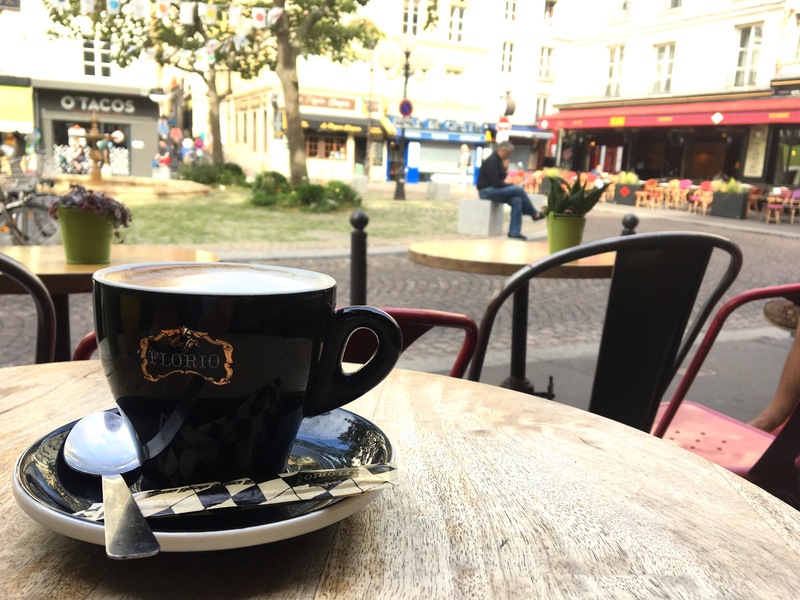 I found a few cafés that weren’t traditionally French but featured pretty decent coffee, and a few cafés with mediocre coffee and a lot of French charm. After coffee I would always head off somewhere, walking through the streets, never using the metro (not in the morning, anyway). 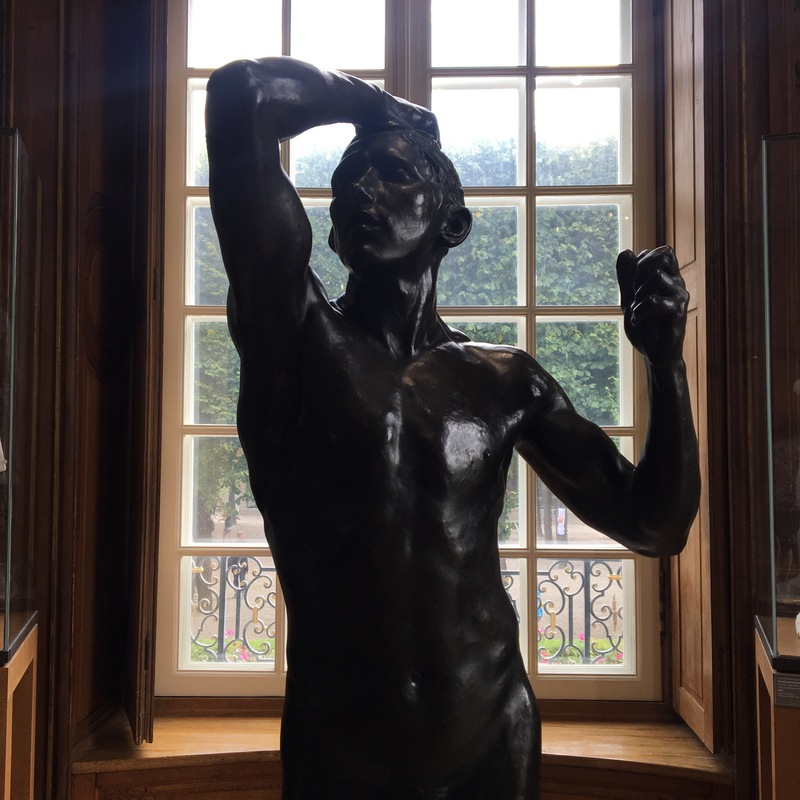 I went to art museums: the Musée d’Orsay, Espace Dali, the Musée de l’Orangerie, the Musée Rodin. I explored the arrondissements, the neighborhoods: the 5th, the 3rd, the 14th, the 17th, the 6th and 7th, the 3rd and 4th, the 20th. 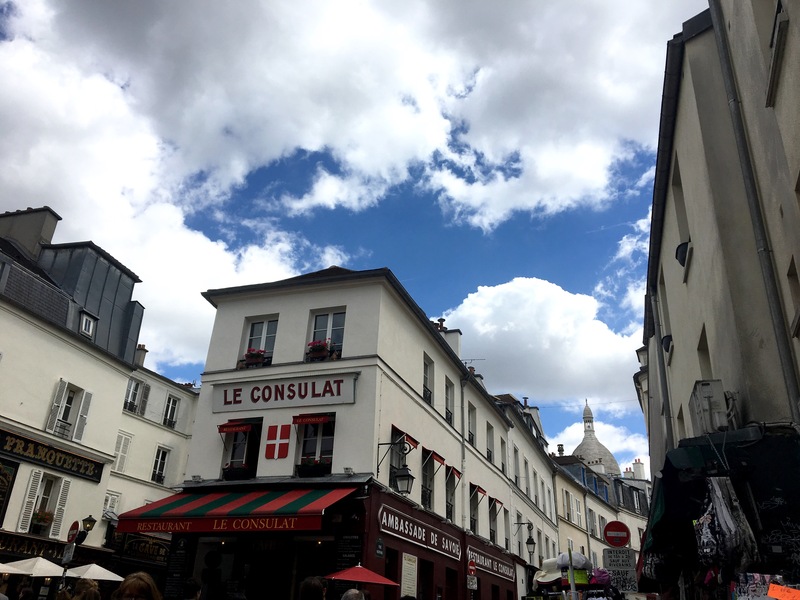 The Latin Quarter, St-Germain, Montparnasse, the Marais, Montmartre. And more. I walked everywhere. I almost don’t want to write this because it seems absurd, but on two separate days I walked 20km through the city. 20km! Around and around and around. But I used the metro, too, I love the metro. 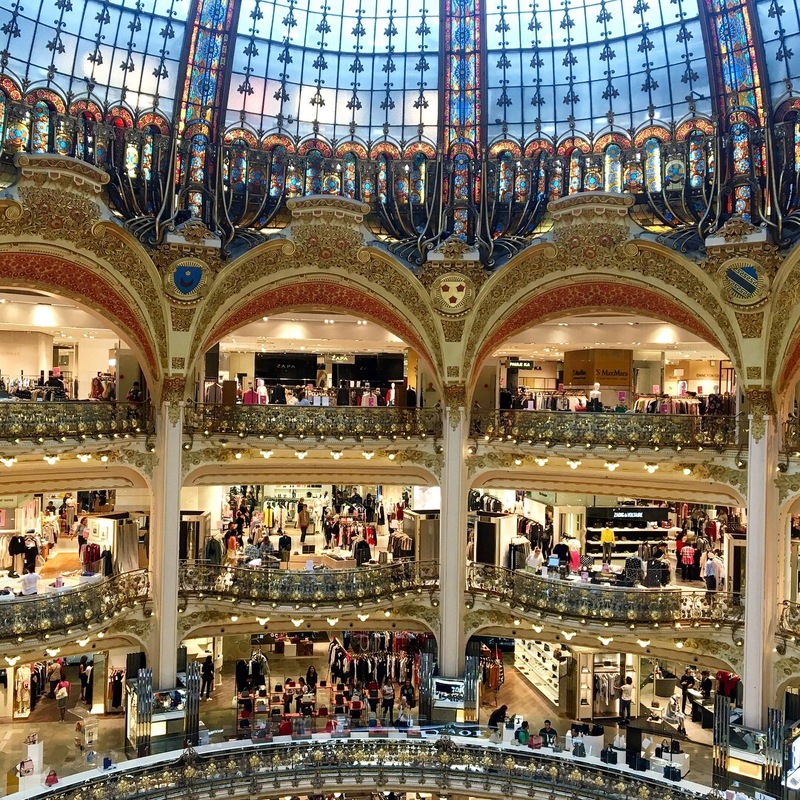 Even in the summer when it is hot down there in those winding corridors, when the smell is so distinct, it’s a smell that screams to me: “This is Paris. 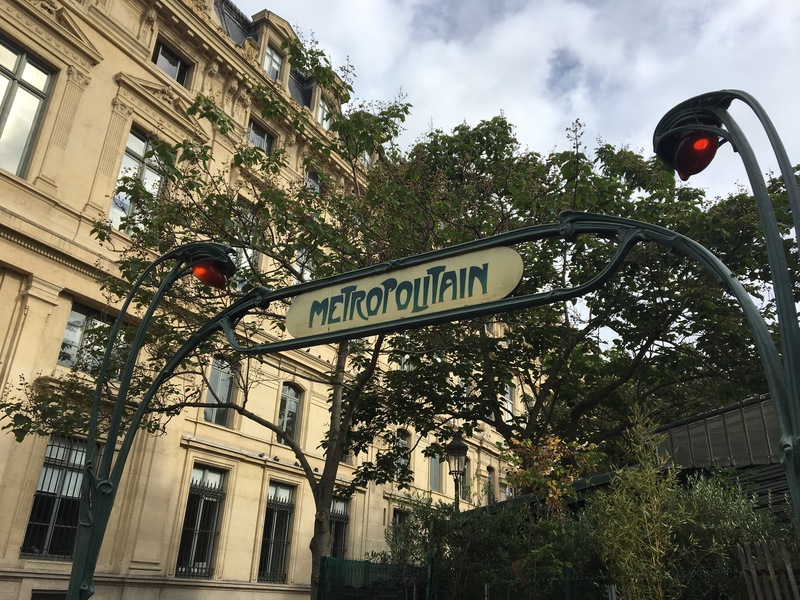 THIS is Paris.” But the metro can take you anywhere, and on the streets you will always find one, there seems to be one at every other turn. I went to bookshops, and I bought books. 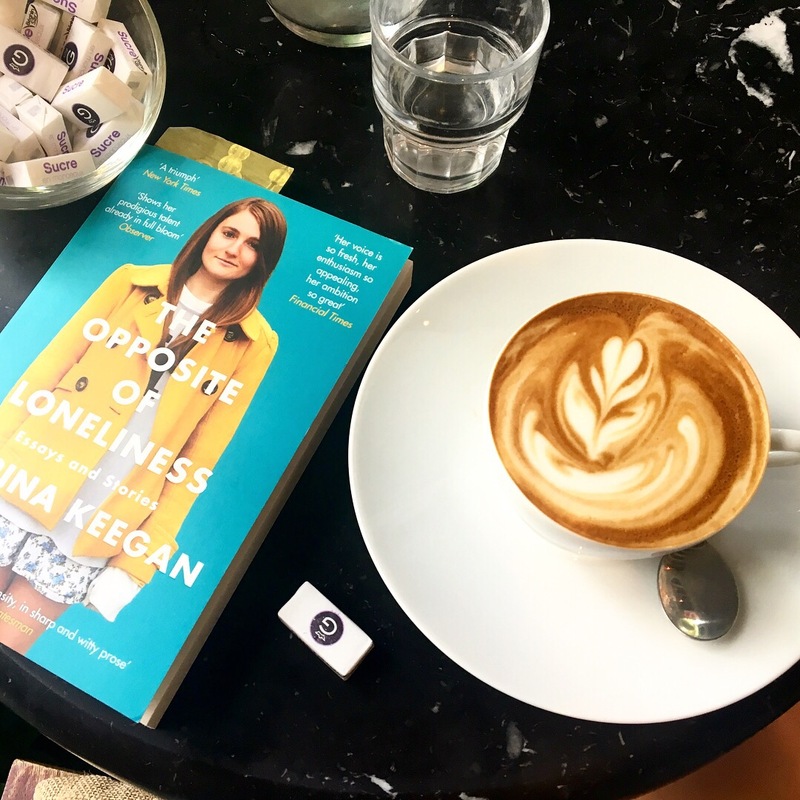 I read books, too, in back rooms of the cafés, with a noisette or a flat white (the coffee that is taking over Paris, apparently), and I’d sit and arrange myself on a wooden stool and I would open my book and read. 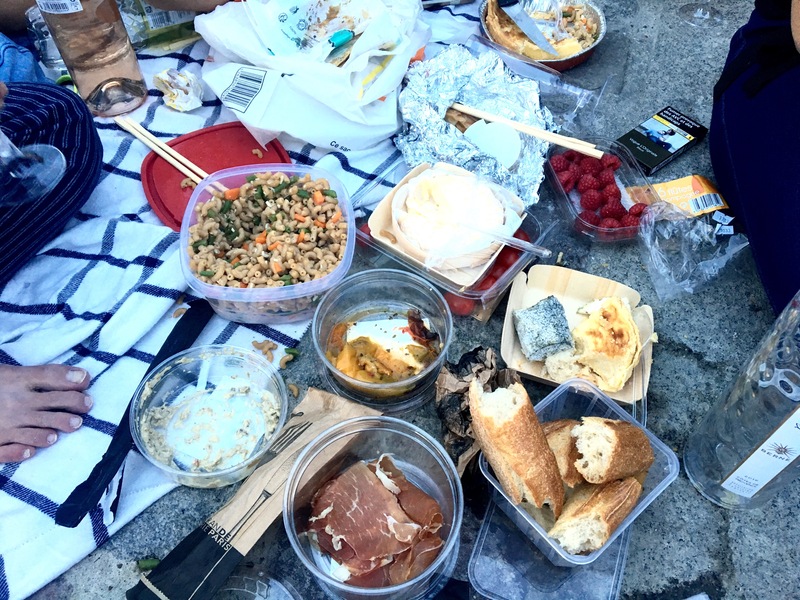 A few times, I met up with friends: for dinner in a bistrot, for a picnic by the Seine, for a glass of champagne to celebrate my birthday. We shopped for picnic supplies in La Grande Epicerie, a place I’d never been to before and I went back two days later to pick up food for lunches or dinners on my balcony: double crème brie, eggplant and yogurt dip, octopus and prawns and mussels marinated in olive oil, crispy baguettes, fresh raspberries. I discovered new places: a covered market where I bought hot fries in a newspaper cone, a street market that I walked up and down three times, just to watch the vendors and listen to the sounds. I bought a bottle of wine from a little shop, a chunk of cheese from another. Parks and cemeteries and canals and squares: I spent a lot of time in outdoor spaces. Jardin du Luxembourg (twice, because it was a 15 minute walk from my apartment), Père Lachaise (twice, because the first time I got turned around and had to leave to meet a friend before I could find Oscar Wilde’s grave. 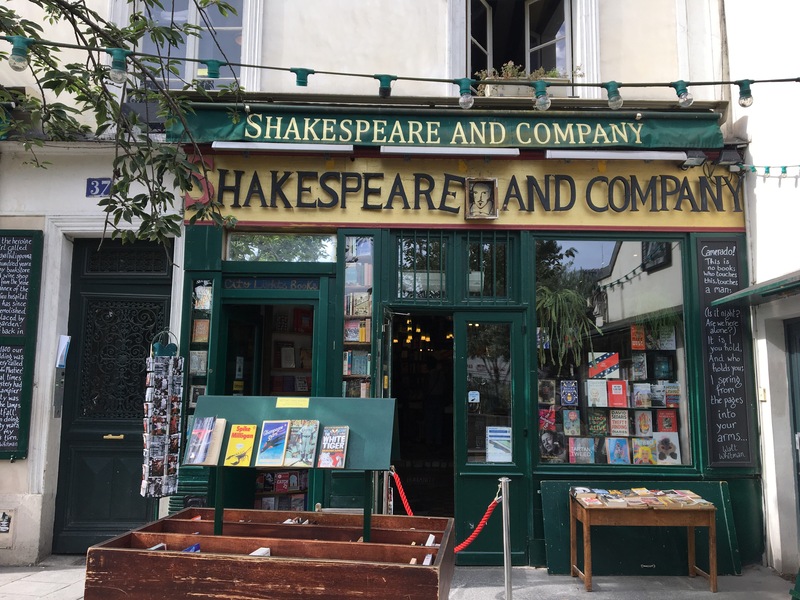 I’ve seen it before- two or three times at least- but it’s like a visit I have to make whenever I’m in Paris. I’m not even sure why, because I’m not a particular fan of Oscar Wilde… I just know that I have to do it). And what else? The Canal Saint-Martin and the Promenade Plantée, the Place des Vosges and the Place de la Contrescarpe. Parc de Belleville. So many things, all of this and more. 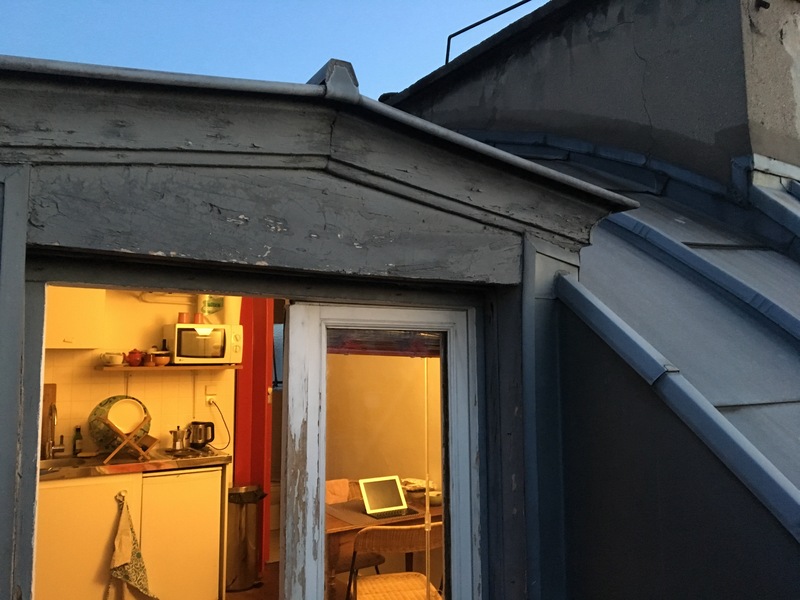 But I also spent time in that little apartment of mine- for afternoon catnaps and a glass of wine in the evening, sitting on my balcony and looking out over the rooftops. At 10pm, and again at 11 and again at midnight, thousands of lights on the Eiffel Tower flash and blink, the tower sparkles for 5 minutes and I could see it from my balcony and every night I was home I would stand outside and watch. 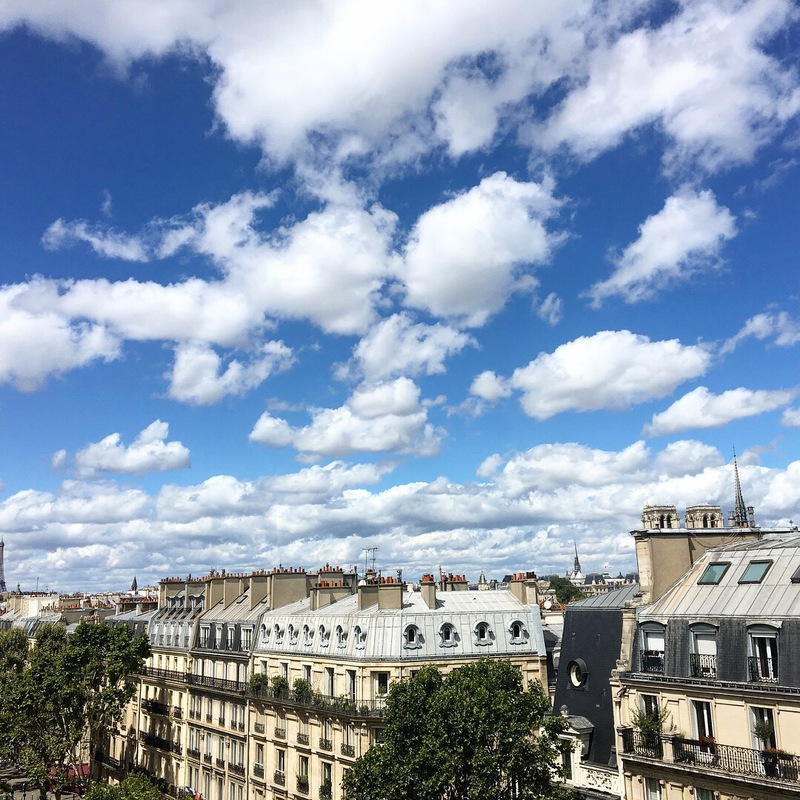 I asked her a lot of questions about what it had been like to move to Paris, to live in Paris, if the language barrier was a problem, if the cultural barrier was a problem. 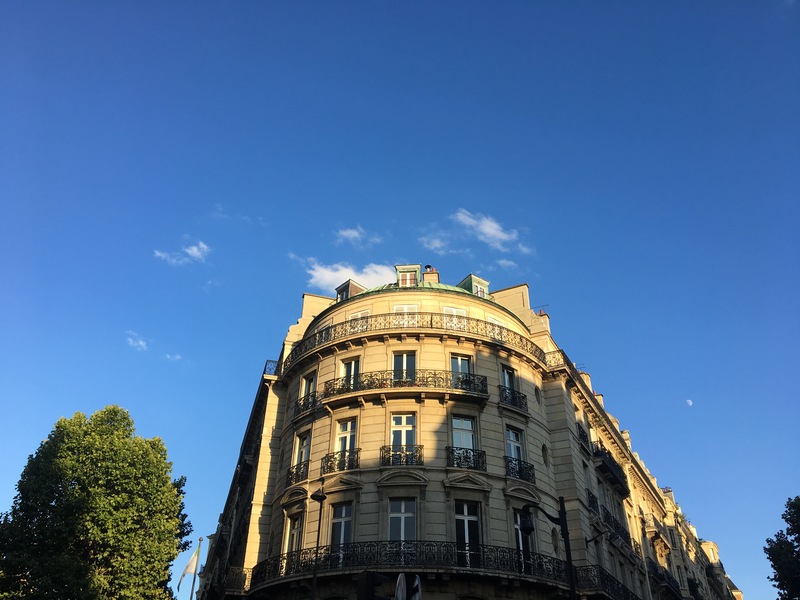 She told me about a French course she took, how she connected with other expats, her favorite things to do, the site she used to find her apartment. And I began to dream. What if I could do this? 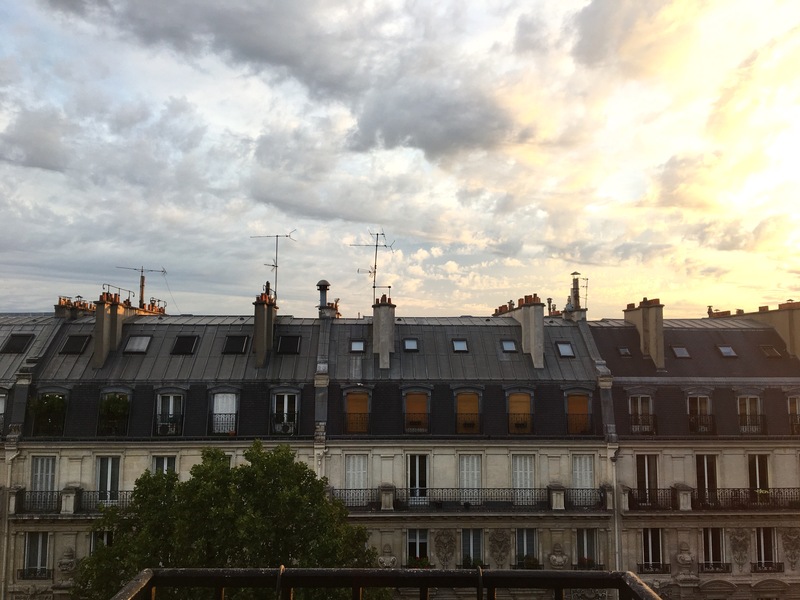 I have an entire life somewhere else but the thing is, I’ve been dreaming about Paris ever since I was 20, from the moment I first laid eyes on the city. And Paris, after all this time, is still a beautiful dream. It’s the city of my dreams. 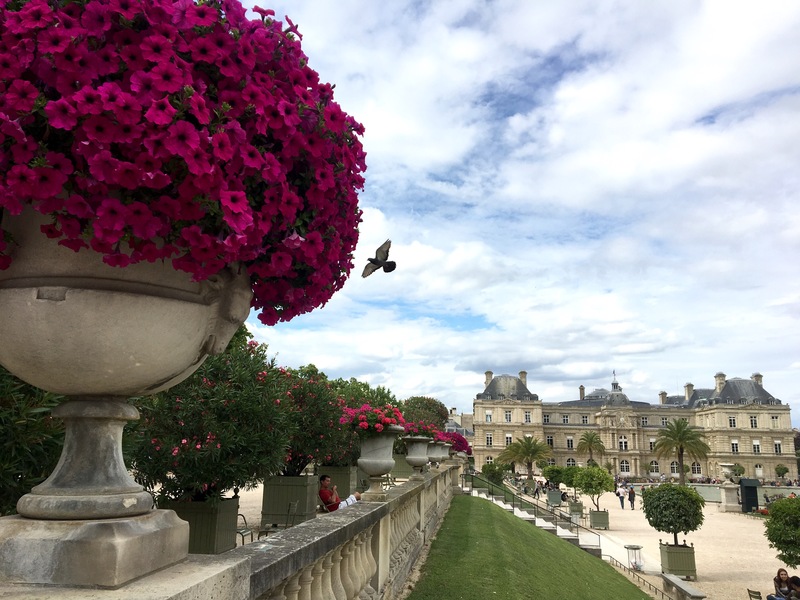 7 different people asked me for directions during my week in Paris; some of them were tourists but some were French, one- an old lady- might even have been a Parisian. I could only give an answer to one of them, a French guy, and I answered with a smile and with an assurance. I’d understood his question, I knew where we were and where he wanted to go, and I could give a response, in French. After a week in the city I was beginning to feel like I knew where I was, where I was going. Could I ever have more time like this? More than just a few days, more than a week? Could I live here for a few months, half a year? An entire year? In my dreams, yes. And if I continue to write and work and aim high and big, if I take chances and with a little (or a lot) of luck, I might just be able to live out my dreams. But, that’s one of my castles in the air and it’s a beautiful one but for now I’ll be grateful for what is right in front of me: the magical week I just spent in a city that I love, the work it took to get myself there, the chances that I’ve already taken in life, the persistance of my dreams for where they’ve already taken me. And Paris will always be there. Whether for a few days or a week or a month, a year or a lifetime; it will always be there. Yesterday, I was thinking about how long it had been since I’d seen a cloud in the sky. It feels a bit as though my entire time here has been under a perfect blue sky, and that is nearly true. But then I remember the last thing I posted here, how the weather was chilly, and I remember that yes, there were clouds. There was wind, there was a cool stretch. 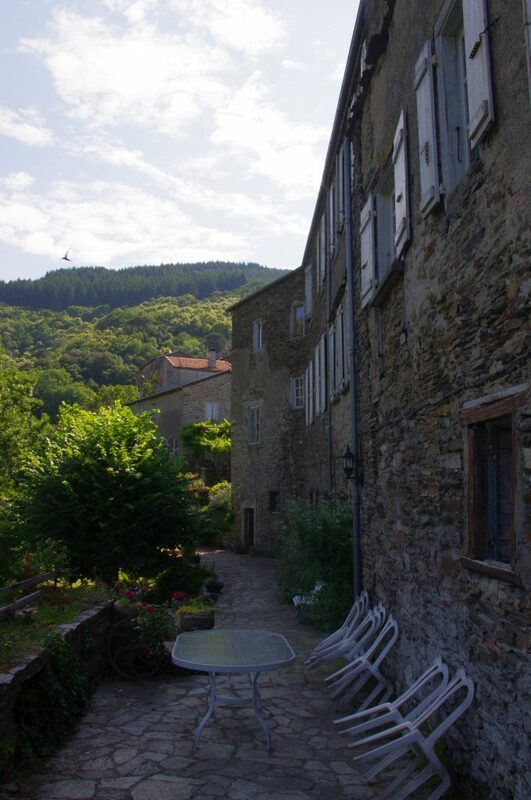 It feels so long ago, that first week when I was settling back into life in a small French village in the mountains, remembering how things are done, relearning how to do them, discovering that some things aren’t the same at all. I finally felt settled, another week passed, and now here we are, almost at the end. I even thought about canceling my Camino, and just staying here. But it’s impossible- the rooms are all booked, which is great news for La Muse and probably the right kind of news for me, too. As much as I want to stay here and never leave, I also want to settle into the next thing… which happens to be Spain and tapas and lots of walking. 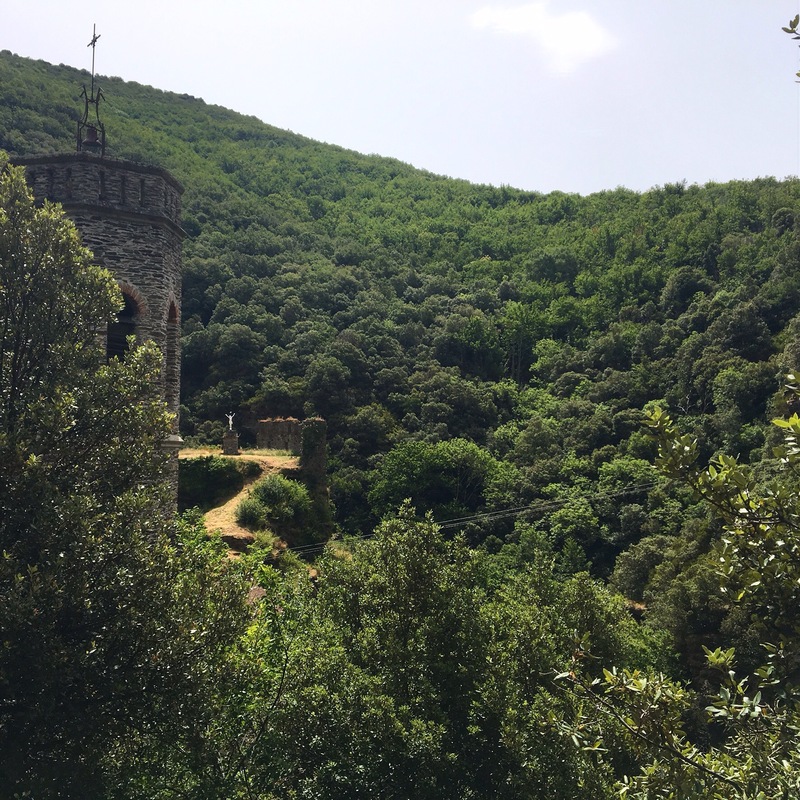 I still have four solid days here, and in addition to my regular brainstorming sessions at Le Roc, the long hikes, the chats with the other residents, we also have an “excursion” down to the ruins of a Cathar Castle (we’re tacking on a lunch in a Michelin starred restaurant, too! ), and a concert and all-village fête on Saturday night. 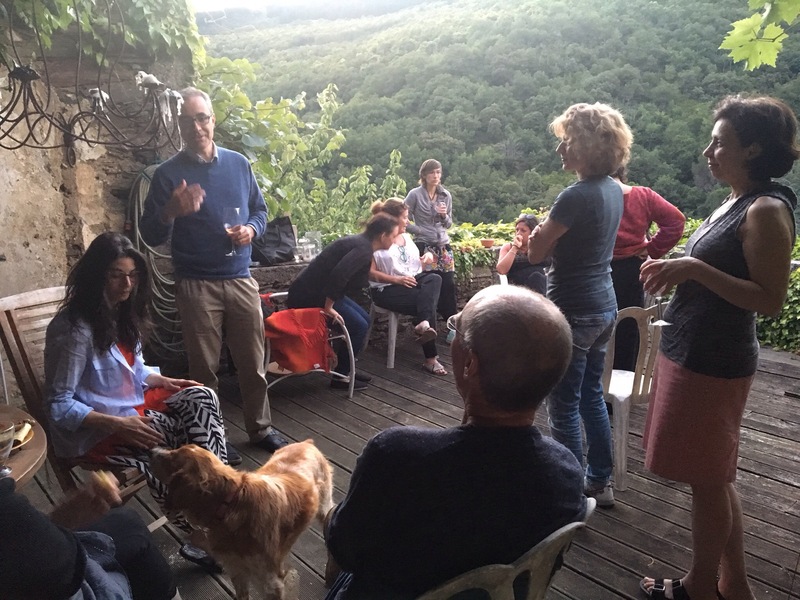 Tomorrow Vera leaves, so tonight we’re all meeting on the terrace for a goodbye drink. Last night we had a reading, two nights before we had more goodbye drinks for Kelly. There’s a really good group of residents here, though I have a feeling I might say that about nearly any group that spends time at La Muse; everyone here is creative, and serious about their creativity. But then you have a great and unpredictable mix of the rest of our personalities: introverts and extroverts, loud and quiet, soft and hard, vibrant and calm. On a few nights I’ve stayed up until the bitter end, talking and singing and laughing with those who remain on the terrace, long past the time when the stars have appeared in the sky. Usually I’m in the “second wave”, not leaving first, not staying until the end. But some nights I slip out as soon as my dinner is finished, the last sips of wine drunk. I sneak cookies upstairs- we’re not supposed to have food in the rooms- and I read a book or write in my journal or work on my story. The work I’ve gotten done here has been difficult to measure. The bulk of my book is written, I think, but it is so very rough, and I’m still struggling to decide what, exactly, I’m trying to stay. So there is still an awful lot left to be done, but I’m feeing good about it. I’ve had the space here to really delve into the heart of this story, and to my surprise, I discovered that I might not want to really share too much about certain parts, and that I have a whole lot to say about others. And just like last time, the most important work seems to have happened away from my desk, away from the computer. 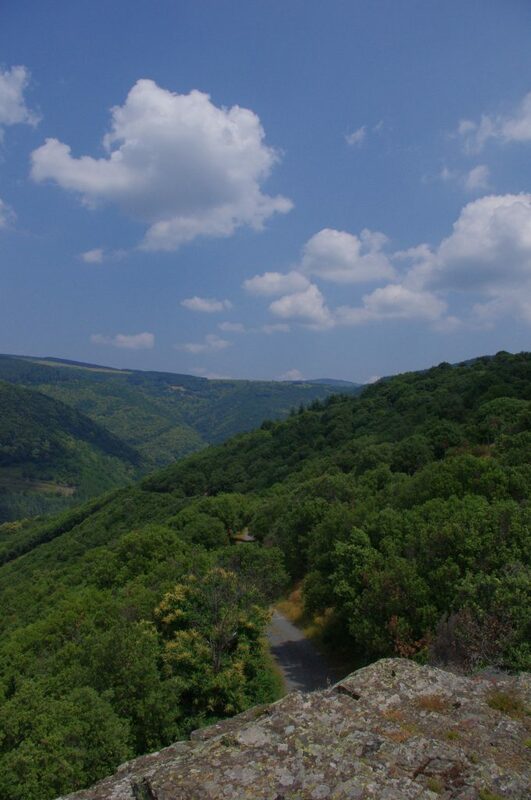 I take the 10 minute path up to the top of the mountain and sit on my large, flat rock and stare off into the valley- the Pyrenees lining the horizon- and after an hour sometimes I just know in my gut what I need to do, what I need to write. I went on an epic hike today; I wanted to get one full, long day of walking in, a sort of “Camino” training day (because in less than a week, I’ll be on a Camino! Hard to imagine right now….). Lets just say that maybe it was a bit too much. I headed for Latourette, which is just another village tucked away in these mountains, though it is not close. 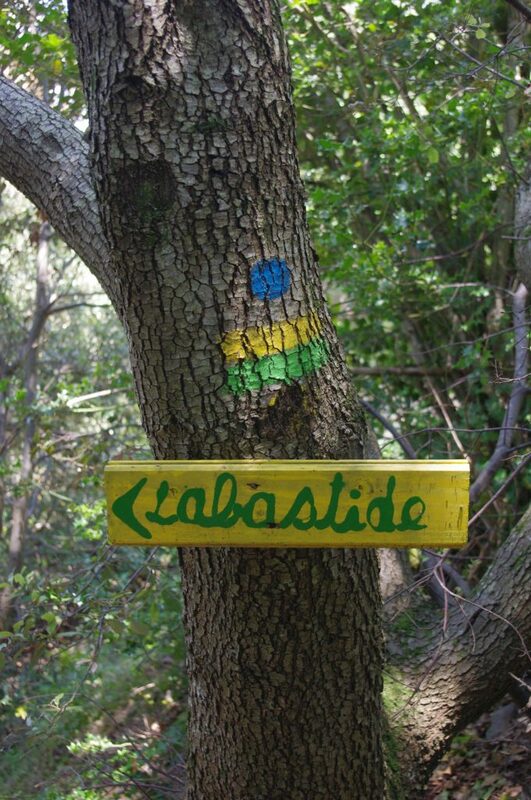 Last time I was here I’d seen signs for it, trails that led there, but it always seemed impossibly far away. 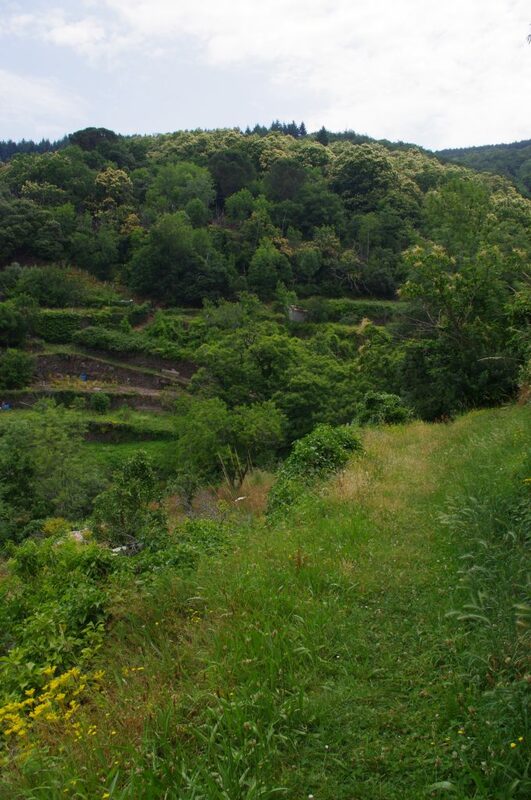 But now that I have hiking experience, Camino experience, it seemed doable. The first half was great- up and down and through these mountains, stumbing on tiny villages that weren’t much more than a few houses and a really old church along with some crumbling stone ruins. I made it to Latourette and sat on a bench and ate some snacks and rested my feet. 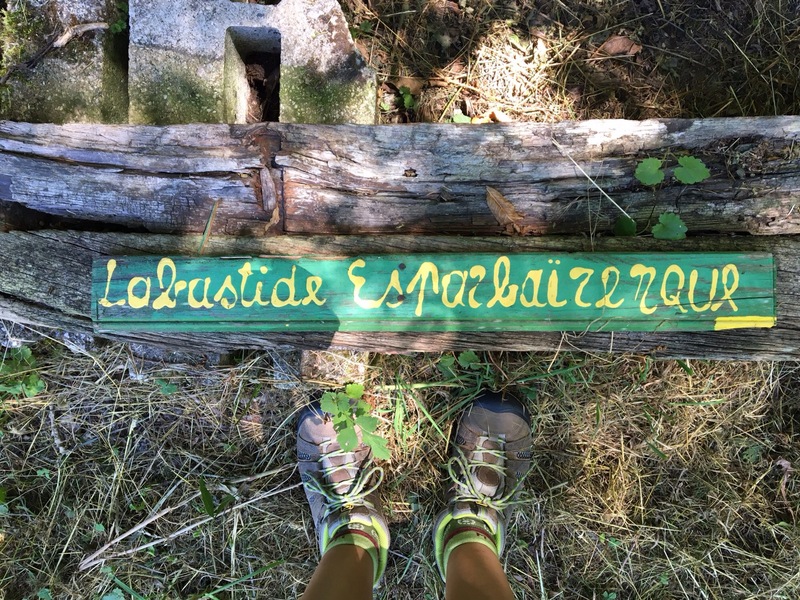 Then I continued on, following a path that I assumed would sort of take me in a big circle and back to Labastide, but the further I walked, the more I realized that it might not have been so smart to follow an unknown trail. I wasn’t entirely sure where I was going, and even though I was always on a marked trail, I had a bad feeling that it was taking me away from where I wanted to go. I kept walking though, hoping that the trees would open up and I could take a look at the landscape and get my bearings. The sun was hot, the air was humid, it was getting later, I was feeling more and more unsettled. 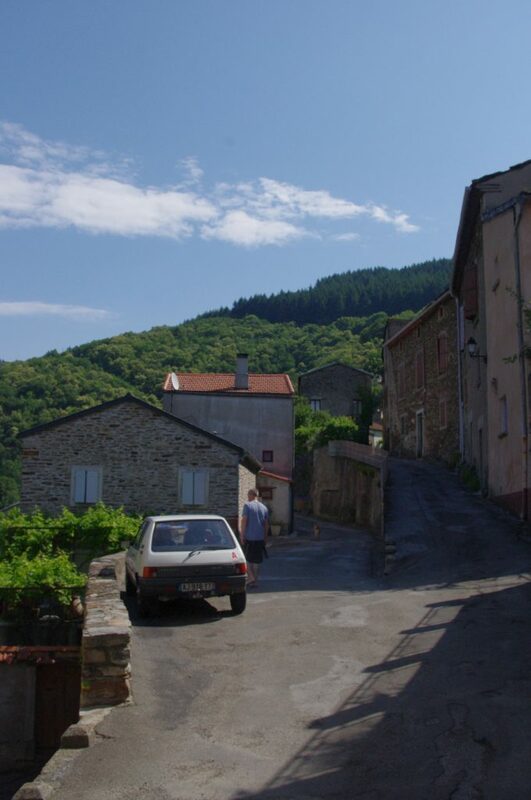 Finally I turned around, walked back to Latourette, and followed a road that I knew would lead me to a village that was not far from Labastide. I stumbled back into the village, my legs feeling like jelly, just as dark clouds gathered in the sky and a little rain began to spit down. It’s still overcast now, the first not-blue sky I’ve seen in what feels like weeks and weeks. The kind of sky that makes it easier to sit inside and get some writing done. Already I can feel myself begin to move away from this experience, my thoughts starting to turn towards Spain, and the Camino. 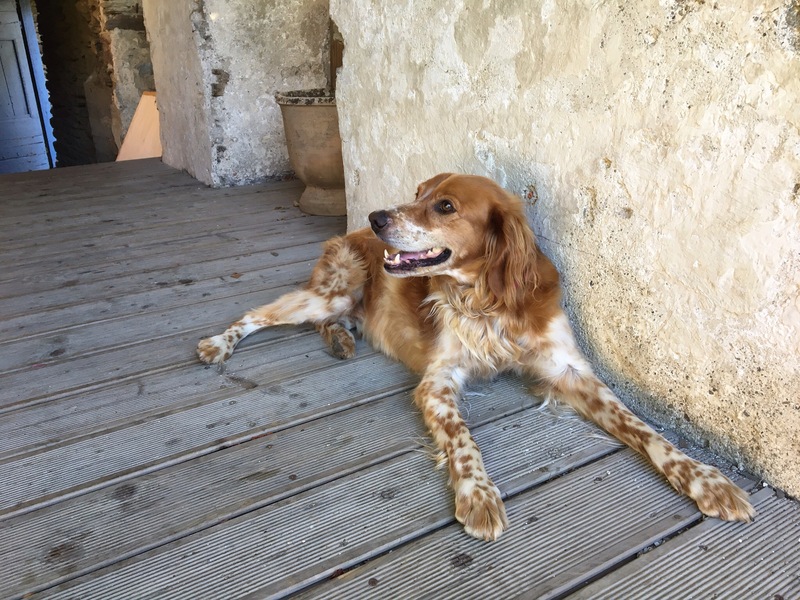 But I’m still here for a few more days and I want to really sink into these last moments: write what I can, wander through the village, sit up at Le Roc, hang out with Homer the dog. And I tell myself the same thing that I did three years ago, as I was preparing to leave: you can always come back. 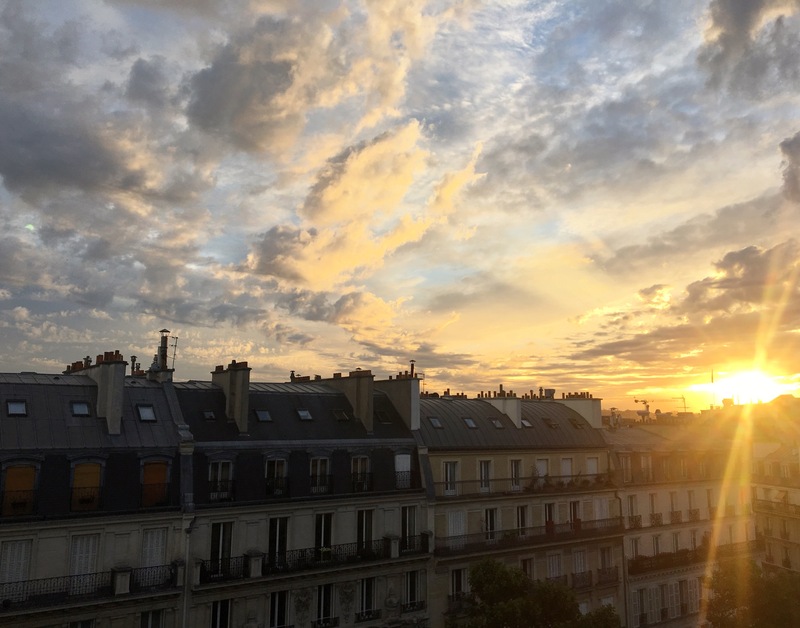 I’ve been trying to write a post about the last day in Paris and the end of my trip, and I’m reminded of why I loved writing in the moment so much: writing about something that happened several weeks ago is a completely different experience than writing about it when the memories are fresh, when they’re all around you. So I’ll start how I often do, with what’s around me in the moment: it’s just after 8am and I have a half finished cup of really strong coffee on the table next to me. I’m in my living room and despite the early hour it’s dark in here; the skies are a thick grey and rain drizzles and pours through the trees, onto the stone porch that’s just outside my door. I’ve had a disjointed and crazy and wonderful few weeks since I’ve been home: a day in my apartment, a week on the road. A few days home again and a few days back out. Back and forth, home and away, over and over. I have one week left of vacation before I return to work, and at the start of the summer, I was tempted to pack in as much as possible: go to Europe, walk the Camino, come home and travel south for a wedding and to see friends. Then take off again- maybe California, maybe Maine, maybe an impromptu backpacking trip in the woods. I realized I was totally unprepared to do any of this, and what’s more, I didn’t want to do anything big. I wanted to sit still for awhile- and even though I’ve been back and forth and continuing to move, there’s also been so much calm in the past few weeks. I moved so much on my Camino. 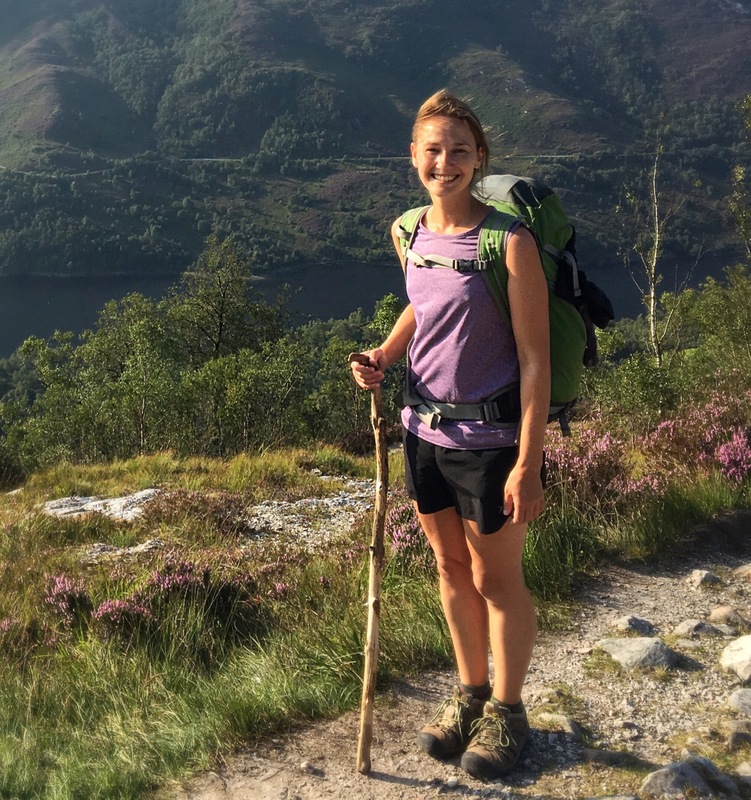 We all do- anyone who walks a Camino- and I certainly moved last year, but this time? I was running, sailing, gliding through Spain. I could feel it- even in the early days of pain and fatigue and blisters, I pushed on, I pushed harder, I made myself move. And by the end, I felt like I was flying. 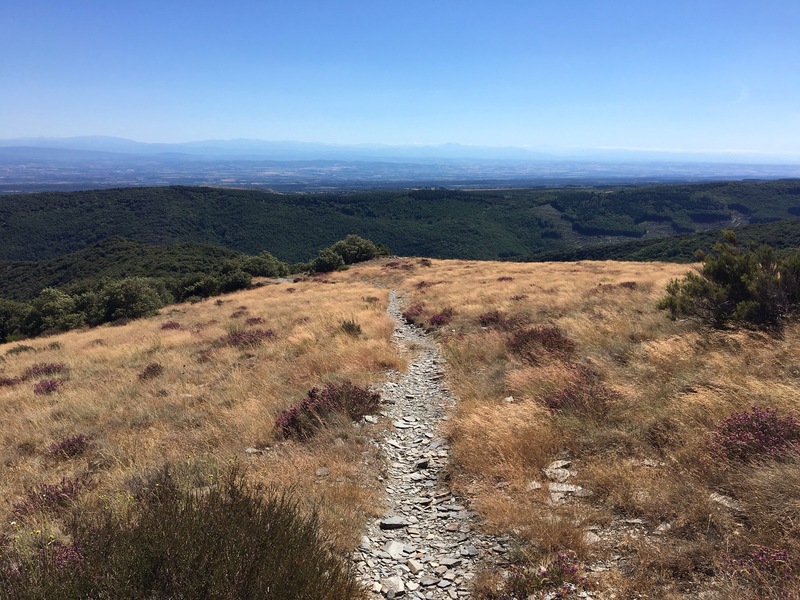 I’ll write more- hopefully- about how I did this walk, why I decided to walk those long days and what I got out of it- but what I’m thinking about now is my mental state, especially at the end of the Camino. My mind was strong. It was solid and confident and settled. 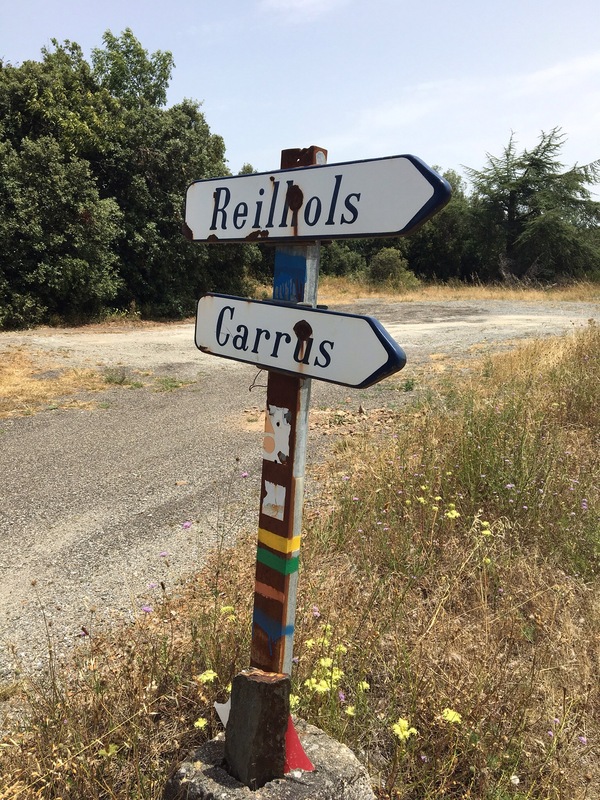 I was so present in my moments on the Camino, but towards the end, I was also aware of what would happen when I returned home, aware of how I felt when I returned home last year. I’d thought about this as I walked, I thought about this during my conversation with Andrea, on my last night in Santiago: the Camino begins when the walking ends. And I thought about this on my last day in Paris. 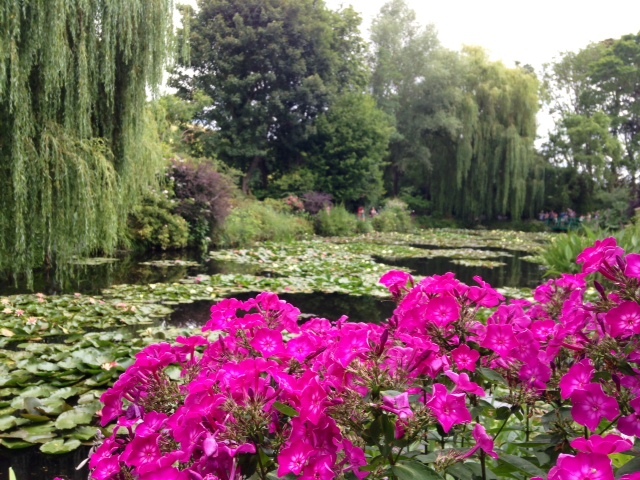 I did a small day trip out to Giverny, the home and gardens where Monet spent the end of his life, and where he did some of his most famous work. I lingered over this trip- I could have rushed to the Gare du Nord and made it on the first train out to Vernon (a town near Giverny), I could have hopped on a bus that would take me with the first wave of tourists into the property, I could have tried to enjoy the gardens and the pond before the crowds would arrive. 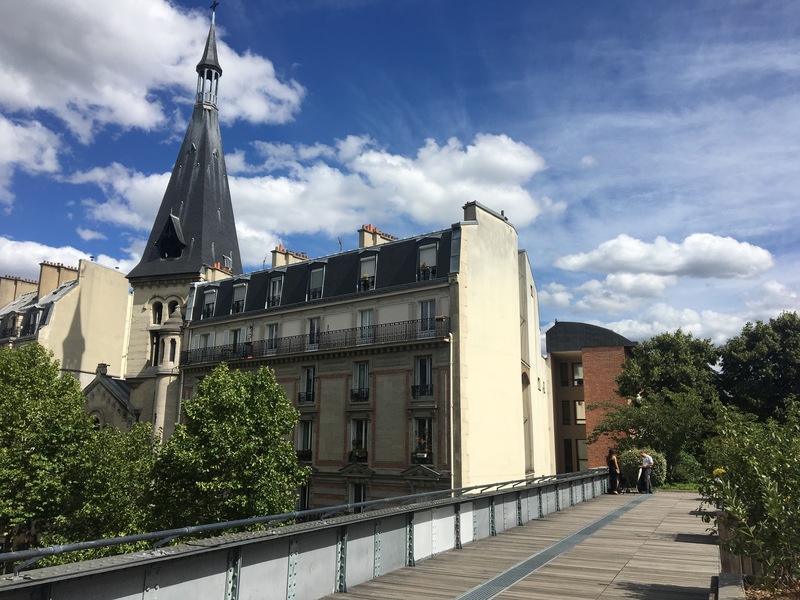 But instead, I lingered over my MIJE breakfast, I slowly wandered through the streets of my quartier and over to the nearest metro. 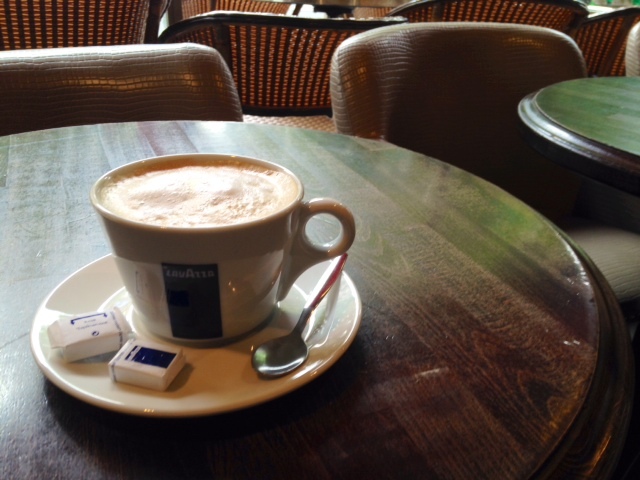 When I arrived at the train station I learned that the next train to Vernon wasn’t for nearly two hours, so I walked through the streets around the Gare du Nord, and found a café near a church. It was on a bustling street corner but inside the café was quiet. I drank a café crème and wrote in my journal and chatted with a man delivering gallons of milk. I’d become confident with my French- or, at least, confident in attempting to speak- and the attempts paid off. The delivery man laughed with me, tried to teach me a few words, told me I had a beautiful smile. On my way out, I passed a waiter who was standing alongside the bar, and dancing slightly to some pop music that was coming from the stereo. When he saw me he grinned, “Il faut dancer!” he declared. I shook my head, laughing. “I’m not good at dancing,” I told him. I waved goodbye, and the waiter, the woman who served me my drink, the delivery man- they all stood together and smiled and waved at me and wished me a good day. 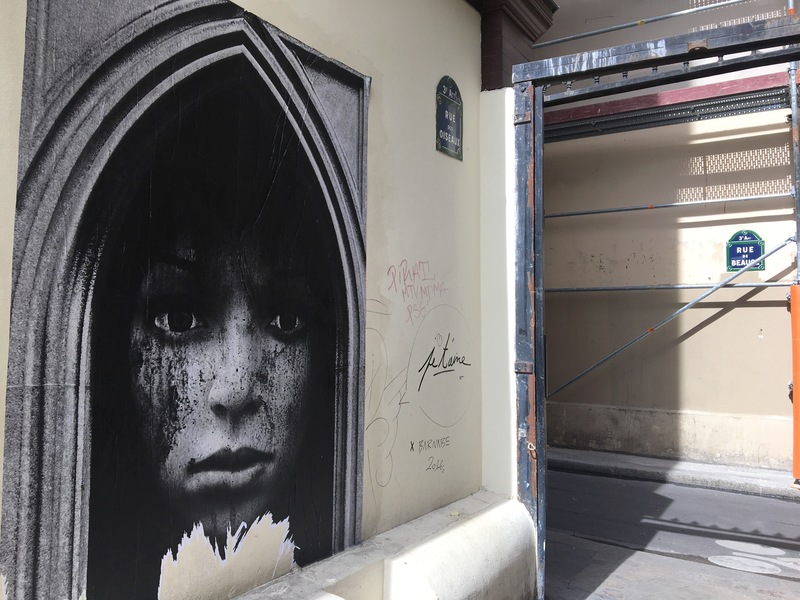 It was strange- in a way- to experience something like that in Paris. I love Paris, but Parisians are often rushed and reserved and formal and they just don’t seem to smile so much. Not at tourists, not at people they don’t know. 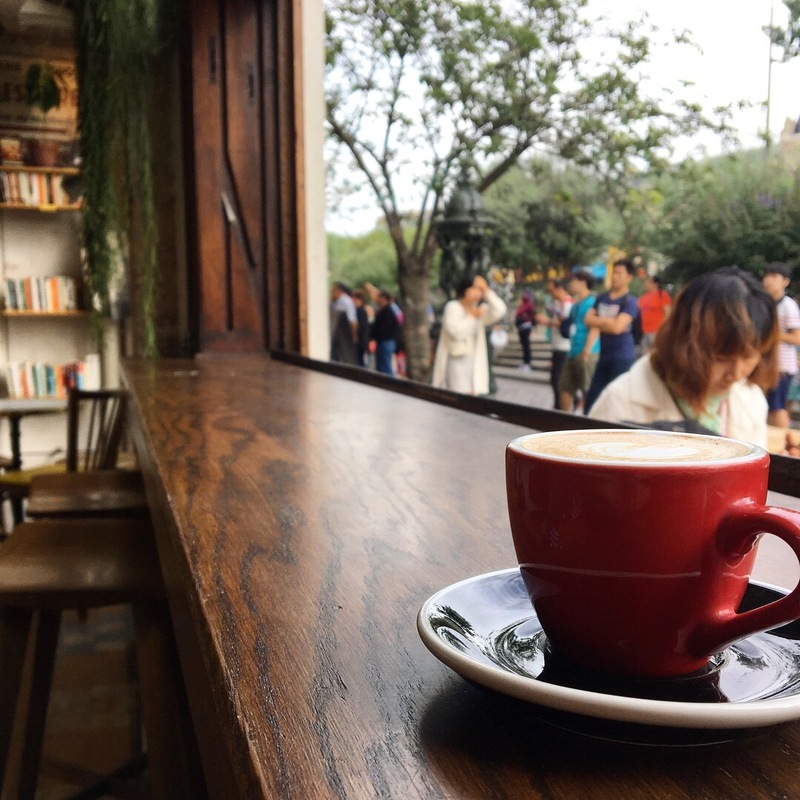 But those moments in the café were different, and I thought about this as I rode the train out of the station and into the countryside: I could have sat quietly at my table and not engaged with the man delivering the milk. I could have smiled politely and not tried to speak. I could have kept to myself, and remained to myself, as I so often do. But I thought of my conversation with Andrea, the Italian, and I thought of what I resolved to myself, just two nights before: that I want to keep the energy of the Camino with me. I want it to shine through and into my life. Maybe I was already practicing this. When I arrived in Vernon, a town about 5 kilometers away from Giverny, there were buses lined up outside of the station to deliver tourists to Monet’s home. But I chose to walk. Of course I did! There is a flat walking path that runs behind houses and past fields, leading straight from Vernon to Giverny. Most took the bus and several rented bicycles but a few others, like me, chose to walk. 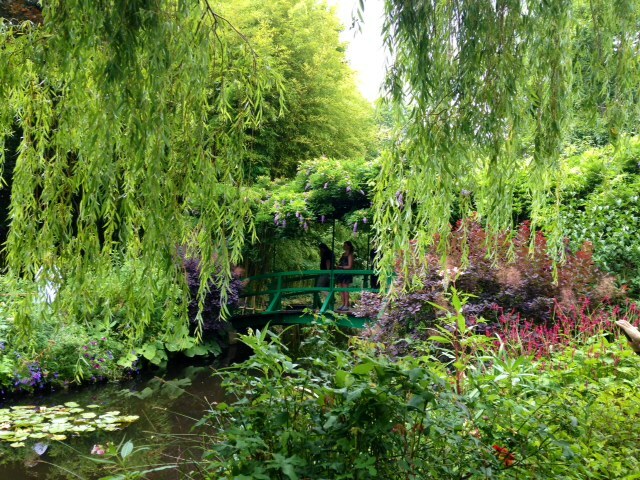 And when I arrived in Giverny, an hour later, instead of going to see the gardens, I first sat down to a long lunch. 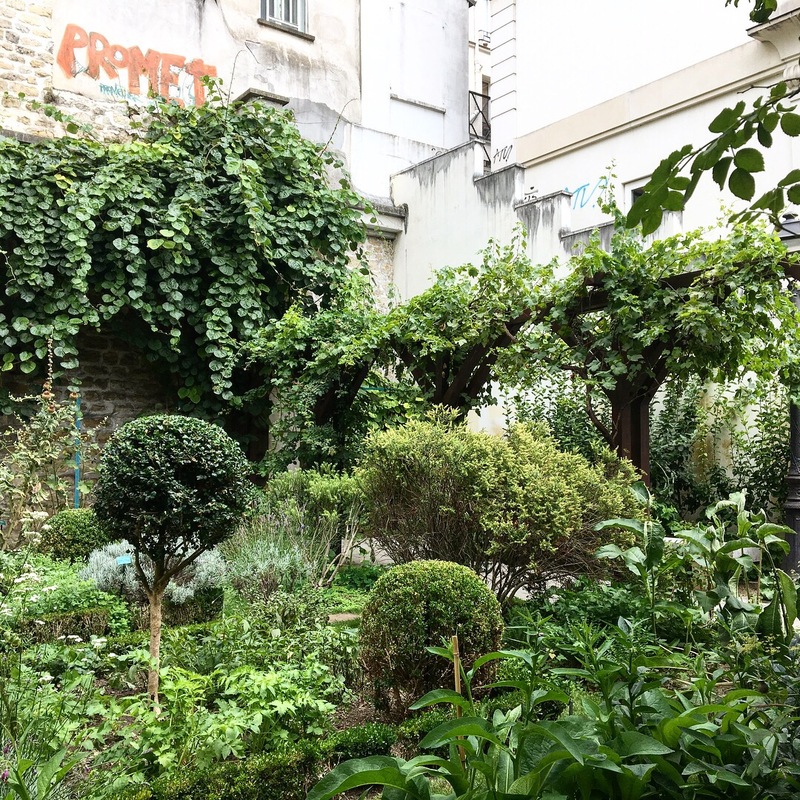 I’d heard great reviews about the restaurant which is part of the Hotel Baudy- just down the street from Monet’s residence- so I found a table on the terrace and ate like a queen: a glass of Bordeaux and slices of fresh baguette. Salad with goat cheese, salmon, broiled tomatoes, crème brûlée. 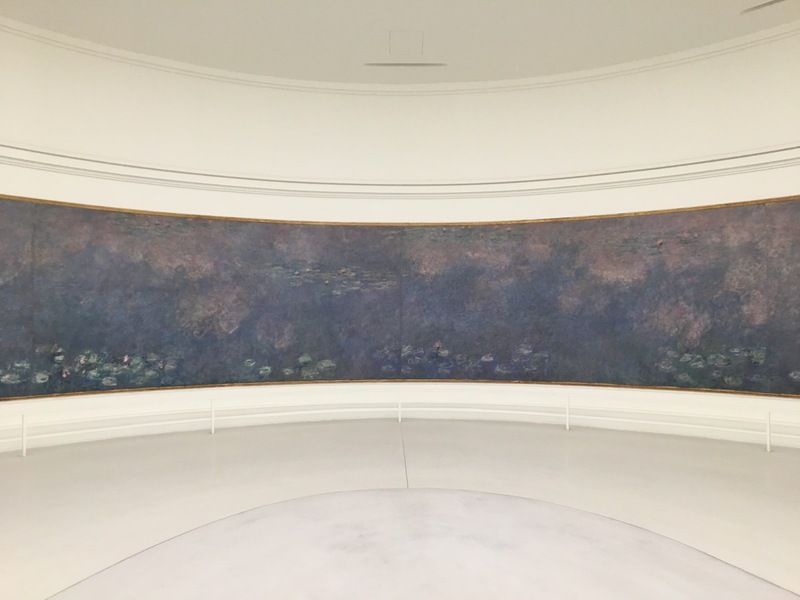 When I finally made it to Monet’s home, it was packed with people. The gardens were beautiful but so crowded. I walked up and down the rows, admiring the flowers, but I didn’t feel particularly overwhelmed with the beauty or inspired by the setting. But then I walked through a small underground passageway and over to the Japanese water garden and when I saw the weeping willows and wisteria covered bridges and the pond full of water lilies- all of that green- for a moment, it took my breath away. I’d had no idea. For as many times as Hemingway has ‘appeared’ in my travels these past two years, I’ve never read a thing by him. And yet, ever since I walked into Café Iruna last year in Pamplona, with Ibai and Mirra and Ji-Woo, I’ve felt some sort of small connection with Hemingway. I think maybe it had to do with being a foreigner in Spain- out on this strange adventure, stepping through towns where he spent so much of his time. When I was in Venice, this past winter, I discovered a bar where Hemingway had spent his time, stationed at a corner table in the cold winter months, working on a book. It was Harry’s Bar, and I made a point to walk inside. I’m not sure why, but suddenly it seemed like if I happened to be in the same places where Hemingway used to be, I should try to track down his favorite spots. 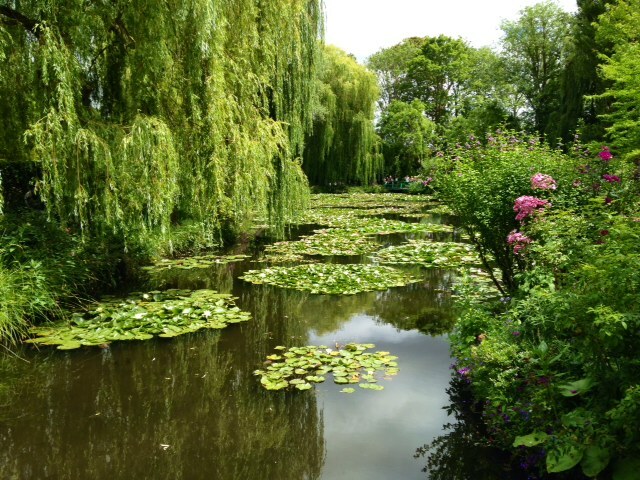 Maybe I was trying to capture those same feelings that I had when I was gazing over the water lilies at Giverny: that quiet, energizing inspiration. I started reading ‘A Movable Feast’ right away- that night on the stiff, narrow mattress in my hostel room, the next morning, leaning against the concrete wall in the underground of the metro, waiting for my train that would take me to the airport. 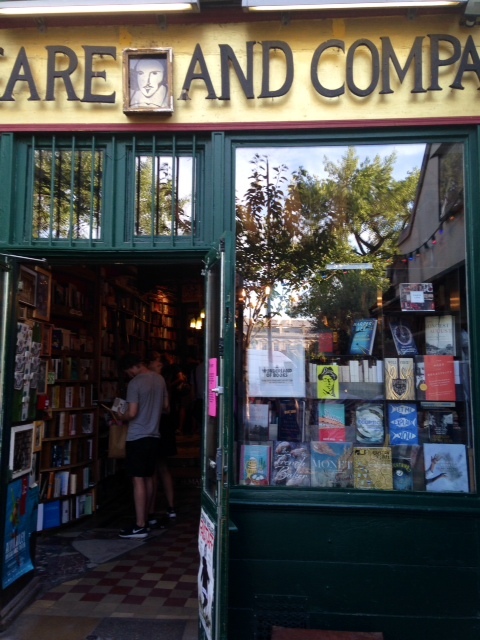 Twenty pages in and he writes about Shakespeare and Company, how he was shy and poor and had to ask to borrow books. I ate up his words as I read, and I realized- amazed though I probably shouldn’t have been- that I really like the way he writes. 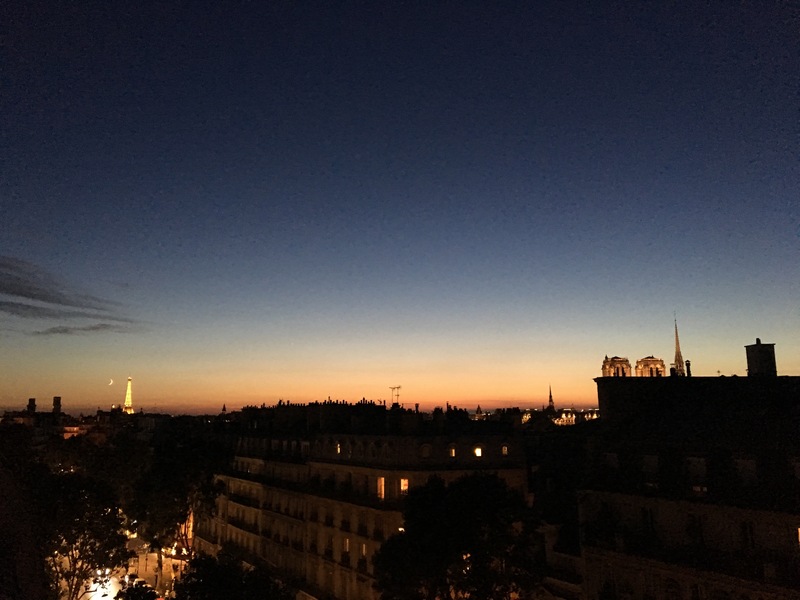 And this is how my time in Paris ended, these are the feelings that I carried back with me from my trip this summer: feeling strong, feeling peaceful, feeling quietly energized, feeling ready to come home, feeling ready to write, feeling ready to figure out how to keep walking my Camino. I’ve noticed there’s something that happens every time I walk outside here. Whether it’s to the source to fill up my bottle with fresh spring water, to wander around and explore the village, or to go on a hike- every time I step outside, I end up going somewhere I hadn’t intended. 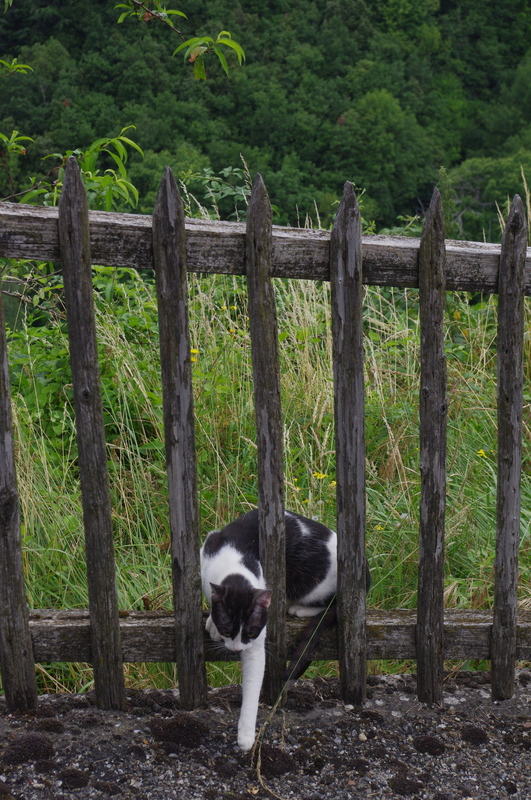 This is what happens: I don’t know my way around yet. It’s a very small village, yet there are winding streets and alleys with staircases and hidden paths and little bridges everywhere you look. So I set out in one direction, and then wander off because something catches my eye, and this continues to happen until I’m much further from where I intended to be. But the result is incredible beauty. And discovery. And surprise. And delight. I’ve been to many places that I consider beautiful, but this is by far the most beautiful yet. It’s magical. It’s wild and overgrown and decaying and alive. I wound my way back to the “main” street, and took a road I hadn’t been on. 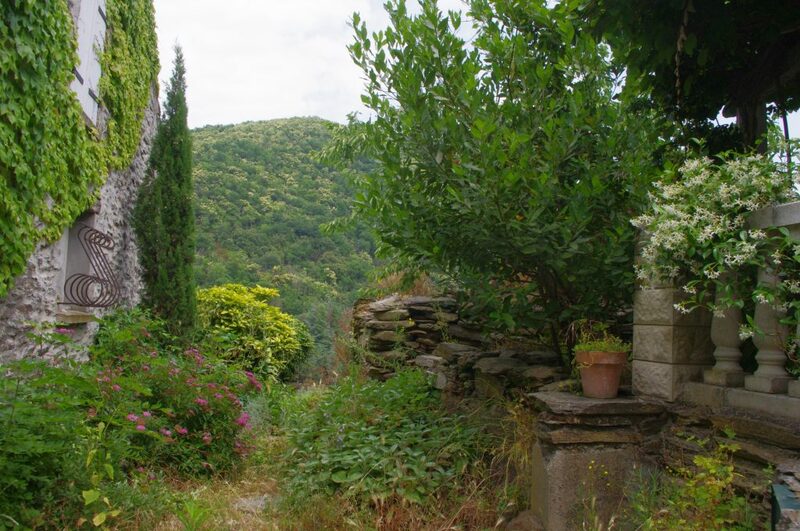 It led me through the village, past houses and people eating on terraces, onto a path leading to the gardens. 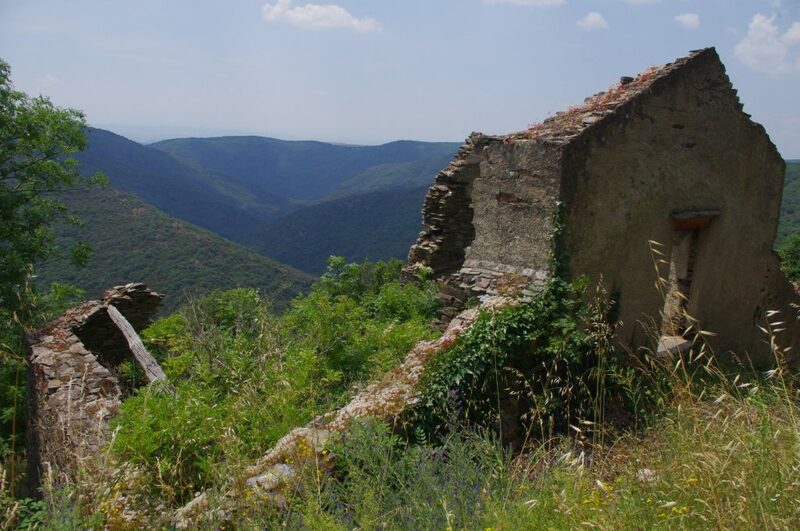 Days before, I’d noticed a zigzagging pattern on the hillside next to Labastide, with stone walls cutting vertically across, separating plots of land. I’d been wondering how to get over there. I took over 60 photos on that little walk, and I easily could have taken 60 more. Later in the day I ventured out again with my film camera, to the farmhouse ruins to take more photos. Each day I find a place that I want to return to, as well as a new place to explore or path to take. Cross your fingers for a rainy day, because it might be the only way for me to get any writing done. I’m sitting at the desk in my room, windows open, cool(ish) morning air, mountain view, House Martins flying around and chirping incessantly. There are fresh flowers on my desk, a mug of coffee within reach, some notebooks scattered around. A single church bell chimes, signaling half past the hour. Though this was only my third morning here, I’ve already fallen into somewhat of a routine. Wake before 8, go down to the kitchen to brew coffee and gather some food (yogurt, fruit, BREAD), say hi to Jean-Christophe and Artis, the other two residents who are always up at the same time, and take my breakfast onto the terrace. This morning went just a bit different: Alain, who arrived last night, brought a little espresso machine with him. My enthusiasm was obvious. I helped him set it up this morning, and tried the first cup. C’est bon. We talked about how the fancy new technology of the espresso machine is at odds with the old and simple ways of the village. And then I enjoyed every single sip of my espresso. There is too much to describe of my first days here, too many details, too many new experiences. The friendly villagers who all say ‘bonjour’ and give you the biggest smile, the winding paths of this tiny village set on the slope of a mountain, the opera-singing resident whose voice fills the little chapel and spills into the streets, buying fresh baguettes from the truck that drives into the village twice a week, sampling wines from a local vineyard… it goes on and on. There are also funny things and mishaps and mistakes. Trying to shop for a week of groceries directly after being picked up in Carcassonne and not having slept for over 24 hours (myself and the two other new residents are now strategizing on how to make our food last), getting into the wrong car on the train in Paris, deciphering the hand drawn trail map and walking miles in the opposite direction of where I intended to go, navigating the personalities of the other residents, remembering the best technique for using a French shower… this goes on and on as well. I’m beginning to feel settled in. It was nearly impossible to sit and focus for the first few days; all I could do was stare out the window and want to get outside and explore. So I did. There is still so much to discover and routines that I need to fully settle into, but I’m getting there. Thank goodness I have three weeks.